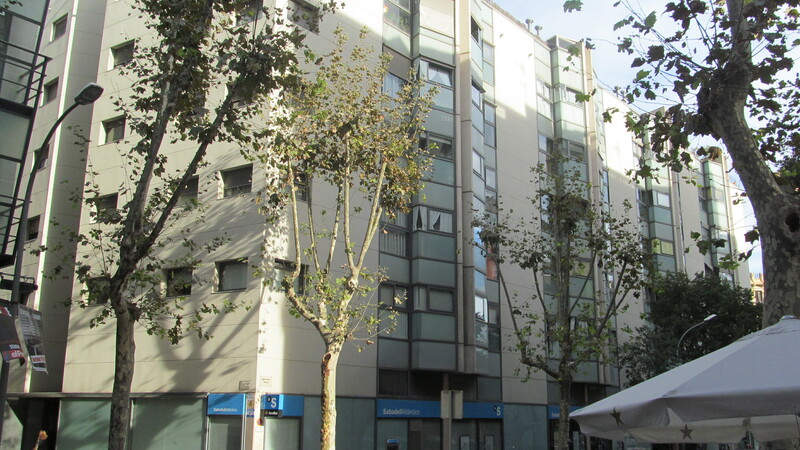 I am staying in central Barcelona, my third time in a straightforward apartment hotel, nothing fancy, but very comfortable and surrounded in all directions by the balconies of Barcelona. My first couple times, my room faced onto the street, which becomes quite quiet as the evening progresses. No problems sleeping! This photo from the intersection gives you a sense of the barrio.. My hotel is a narrow contemporary fill-in in mid-block, not worth a photo. All intersections are on the diagonal. The modern building on the right is an elementary school. I noticed it first from the other side when I looked out my window to discover serendipitously this amazing ‘third space’. 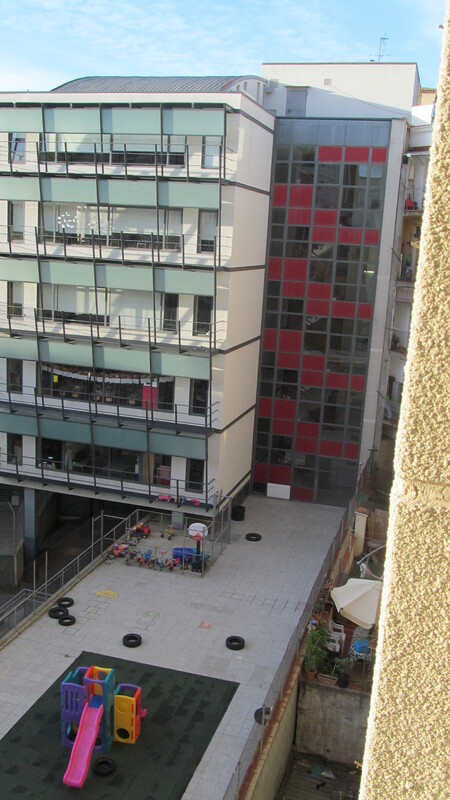 The back of this very attractive school building with its playground. I did a bit of research. 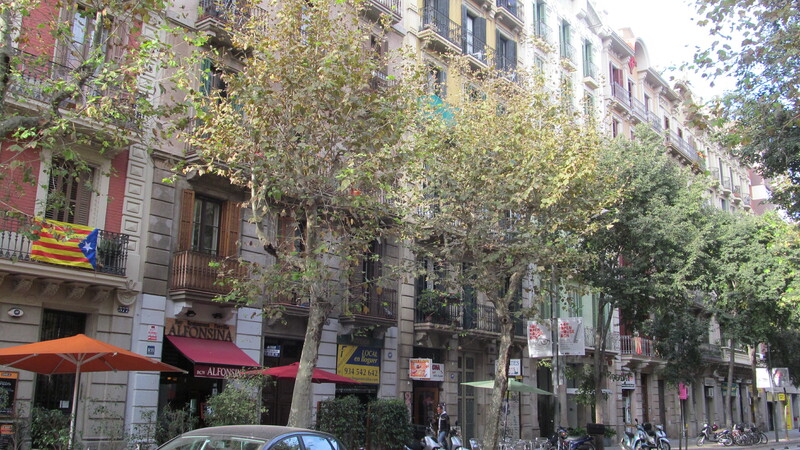 This area of Barcelona dates from after 1850. Catalonia has had a long, difficult history with central Spain, it has been independent and powerful in its own right in the past, it was annexed by the monarchy in Madrid. After one of many rebellions in the early 18th century, the monarchy in Madrid enclosed the city in walls, not to protect the citizens but to keep them in, a larger version of the Jewish ghetto. Curious! These walls were finally demolished in the 1850s, and the city leaders set out an ambitious plan to expand the city, with broad avenues, plazas, and blocks of housing. It is clearly a grid and my block is typical, something around 100 metres square. I went for a walk this afternoon around this block. 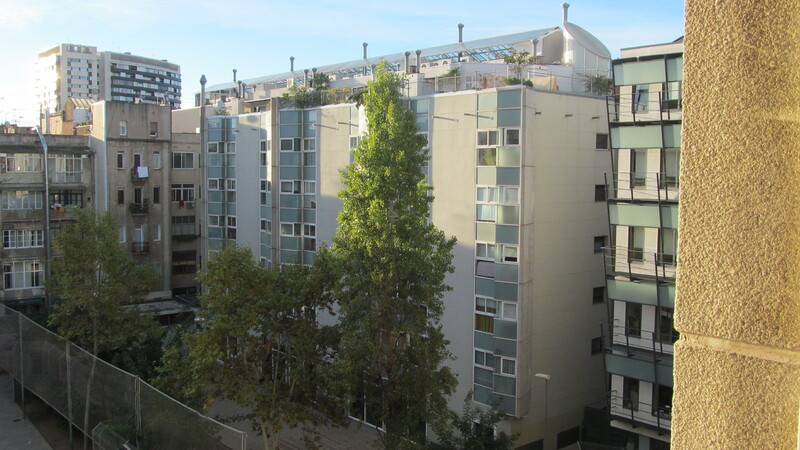 On the southern flank beside the school is a modern affordable apartment building. The eastern face is from the early days of the neighbourhood, complete with wonderful balconies and all the usual neighbourhood shops and cafes. 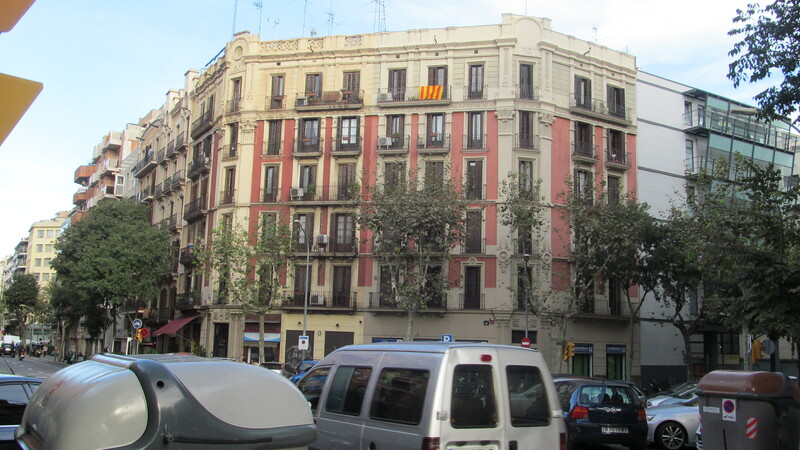 The red and yellow flag, ubiquitous in Catalonia, asserts the independence of this region from Spain. The other flank is also contemporary. One final very short video taken in the after school period. The safe place within becomes alive with kids, their grandparents chatting on benches among the trees. I continue to be impressed by Spain and by its people. Looking out my window allowed me to deepen this. As I walk these blocks during future visits, I will be now imagining the interior spaces of the many other square 100 metres, looking for opportunities to have a peak. This entry was posted in Barcelona, children's playgrounds, Spain, travel in Spain, Uncategorized and tagged Barcelona, children's playground - serendipity, contemporary architecture - Barcelona on November 7, 2012 by agnotarte.